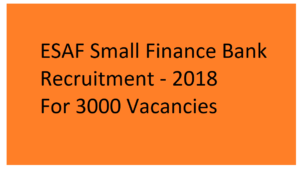 Apply Online now for 3000 Sales Officer, Branch Head and other vacancies in ESAF Small Finance Bank at Kerala. Online Application will Started from 1st May, 2018 to 21st May, 2018. where 3000 opportunities are there. Eligible candidates may apply for it. After the completion of apply for job in ESAF Bank, For the notification you may visit the www.esafbank.com. All notification are updated regularly at www.esafbank.com. you can get notification via email. A Company have rights to cancel anyone’s application and interview without assigning any reason. if any person are not eligible for the given post, candidate cant be called for the interview. notification will be sent by your registered email in the application form. Also you can get notification via SMS on your registered Mobile Number. We worked on it regularly. we advised to watch our updates and news regarding ESAF Bank Officer recruitment. Note : Age Limitation are not a comfort zone for the bank officer and highly experienced bank employees. First of all Eligible Candidates have to give written aptitude test, that is a first round. second round is Interview by ESAF Bank Recruitment Team. then after completion of interview third round is Group discussion. After the completion of all three round you may notify for you selected or not ? by ESAF Bank authority. For the selection you have to passed out three round. Registration of candidate : Candidates can be done registration here. Document Verification : Here, candidate’s document can be verify by authority. such as Aadhar Card, PAN card. Aptitude Test : Reasoning and Computer Aptitude test conduct in this phase. authority can be check banking awareness of candidate. Group Discussion : Group Discussion is about an Communication, Presentation Skills, Content, Initiatives of candidates. Final Interview : Here Final decision will be taken by the ESAF Bank Recruiting Team. if any candidate provides wrong or incorrect information at any stage of the selection therefore, candidate can be disqualify from the selection process and candidate will not be allowed to appear in other recruitment in the future. Final decision will taken by the ESAF Bank authority without any partiality regarding selection process. Candidate will assign for the contract based job. Compensation will be offered on CTC basis as per the market and Candidate’s qualification and experience. also compensation based on the suitable post. here, CTC were fixed. If any candidate performance is beyond the expectation so, authority offered above the fixed compensation. salary must based on Qualification, Experience and candidate’s performance. salary is not a constraint for right candidates. How to Apply Online for ESAF Bank Recruitment 2018 ? We have a Link to apply online for the various post in ESAF Small Finance Bank at Kerala. you can apply online by using this link www.esafbank.com. Here we provides some steps to apply online in ESAF Bank. First of all open this link www.esafbank.com. Choose the Post, you want to apply for it. You will see information regarding post and click on Apply Online. If you are New User, Click on option ‘Click here for New Registration’. After completion of Registration process, you have to click on the ‘Submit’ button. Now you will get Registered Number and Password. Log In with your Registered Number and Password. Now Upload your Photograph and your Signature. 2 How to Apply Online for ESAF Bank Recruitment 2018 ?